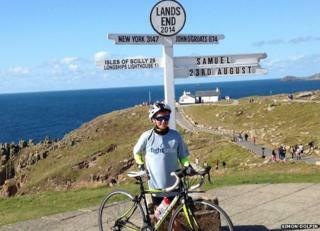 A young boy who has cycled from John O'Groats to Lands End has raised more than £11,000 for charity. Samuel Jennings, 12, of Bude in Cornwall, said he was now looking forward to eating a "nice pasty". He has spent three weeks cycling more than 1,000 miles for a number of charities including the Children's Hospice South West and Bude Seapool. His father, Paul, said his son only started cycling after watching Bradley Wiggins win the Tour de France in 2012. Paul Jennings said: "I'm a very proud dad, cycling over 1,000 miles from one end of the country to another for the benefits of other people, he is amazing. "He gave up his summer holiday, three weeks dedicated to cycling 60 miles a day. Every day, wind or rain. It has been an amazing experience." They dedicated the ride to friends of the family whose son, Daniel Popham, died aged nine weeks from spinal muscular atrophy. Samuel said: "I wanted to do it for charity and I like cycling. I started the ride 17 days ago and now I have finished."